Hi Girls!! I have heard a lot about the Dead Sea mud masks as they are rich in certain minerals that can rejuvenate the skin and give us a glowing skin. Yeah, that is what we want. 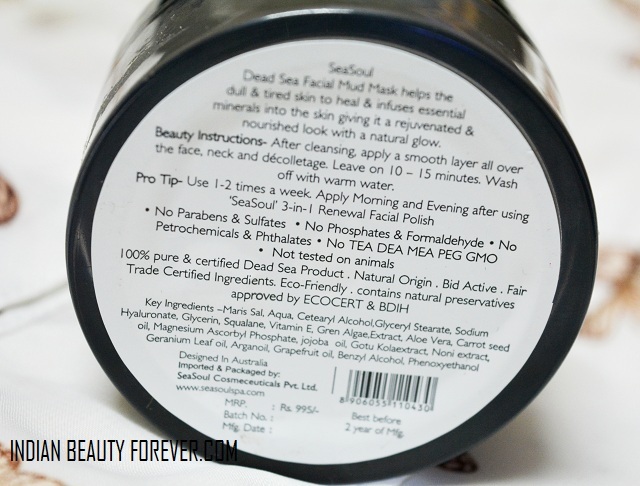 :) So, I got this Dead Sea facial mud mask in one of the Fab bags and I just loved this. Mud mask are really beneficial for people with oily skin like me. I am going through this strange phase where my T zone is getting oilier day by day. I know in summers oily skin tends to get oilier but this is like crazy currently. The product comes in a regular tub/jar packaging which I think is okay in this case. Even though I prefer a tube pack. But this will do with this product. 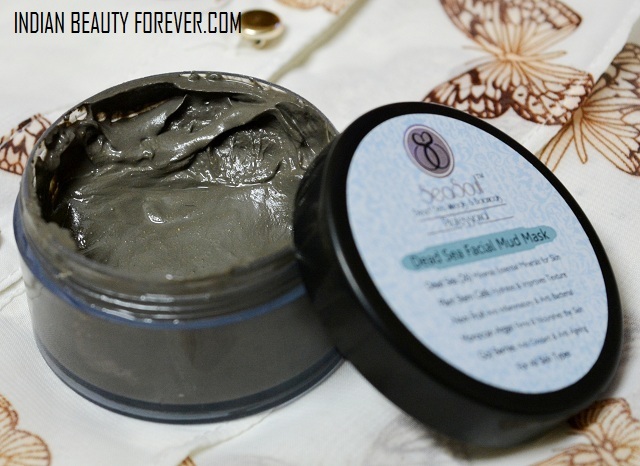 This mud mask has around 26 Dead Sea minerals that infuse the skin with essential minerals and heals the tired dull skin. This is the reason why the Dead Sea mud mask are really popular. Apart from that this has Argan oil which is truly magical for the skin and hair. Yeah the same oil that is there in the Livon Moroccon silk serum as well. In fact this mask smells like mud mixed with oils. Argan oil firms and rejuvenates the skin. I was worried that this mud mask has Argan oil and jojoba oil. Now when we hear oil in any of the product then we are like no ways, I am going apply more oils to my already oily acne prone skin to get my pores blocked. This used to happen with me to until I came to know that not all oils will block the pores. Like Argan oil has Comedogenic rating of 0 Zero, which says that this will not block the pores so, can be safely used on the oily skin as well. Even jojoba oil has a low comedogenic rating therefore, I was relieved to use this. Mud or clay as we know absorbs the excess oil from the skin and the oils will make sure that the skin stay hydrated and doesn’t get too dried by the clay’s oil absorbing properties. The best thing is that this mud mask is free from phthalates, parabens, cruelty free (yaay) and eco friendly. It also has plan stem cells that improve the skin’s texture. Okay, moving on to how I used this. I would start with cleansing my skin with plain water and pat dry. I take some on my fingers and apply that evenly on the skin. This is tad thick so, I think it will be better to use this on the slightly wet skin, So the next time. I washed my wash and let the skin to be slightly wet. This time the application was way smoother and easier. The mask would get fully dry in around 15 minutes, considering the hot weather these days. Then I would wash my face. Results: My skin felt smoother as it takes off the dead skin cells and also my face looks brightened like the accumulation of oils etc will make the face darker looking. But as this mask squeezes out the oils from the skin, skin appears tighter and brighter. I loved this facial mask. It is different and better than most of the mud masks that I have used mainly because of the dead sea minerals. But the only problem is the price. This is for like 995 rupees which is expensive. 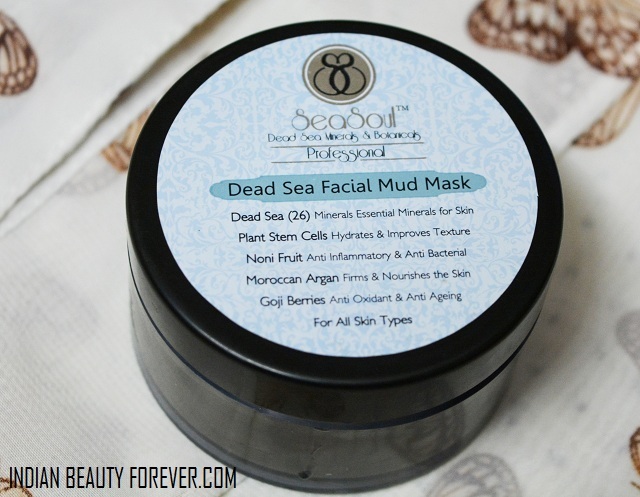 SeaSoul Dead Sea facial mud mask is a great facial mask for the tired dull oily skin that needs rejuvenation. I liked the way this cleanses and makes the skin better looking. looking to buy this.. where do i get it? This one is truly tempting Niesha! This is so tempting & sounds wonderful. I agree with you, it is good but way too expensive for a mask.